Put this in your juicing thingie and juice it. Remember when juicing: stems, leafy parts, and unsightly but-still-tasty bits of the vegetables that you might otherwise throw away can still be used! Plant parts that may be unsuitable for cooking are often totally fine for juicing! Obviously though, don't use anything past its prime. I was gifted with a juicer about five years ago, and I absolutely love it. Here's a crap iPhone photo from a few years back. 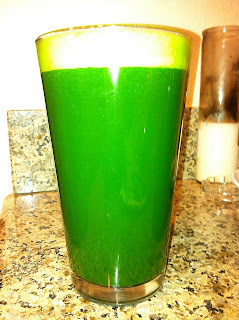 One thing about juicing that nobody ever told me. If you have a sensitive stomach, you have to be careful. Drinking raw juice in the morning before I eat solid foods is hurlsville for me. In other words, I absolutely believe in the health benefits of juicing when combined with a balanced, organic whole foods diet. Do I believe exclusive juice fasts should be done without professional supervision? No.